Amsterdam fans out south from the Amsterdam Centraal railway station. The oldest area of the town is known as de Wallen (the quays). It lies to the east of Damrak and contains the city's famous red light district. To the south of de Wallen is the old Jewish quarter of Waterlooplein. The medieval and colonial age canals of Amsterdam, known as Grachten, embraces the heart of the city where homes have interesting gables. Beyond the Grachtengordel are the former working class areas of Jordaan and de Pijp. The Museumplein with the city's major museums, the Vondelpark, a 19th-century park named after the Dutch writer Joost van den Vondel, and the Plantage neighbourhood, with the zoo, are also located outside the Grachtengordel. Several parts of the city and the surrounding urban area are polders. This can be recognised by the suffix -meer which means lake, as in Aalsmeer, Bijlmermeer, Haarlemmermeer, and Watergraafsmeer. Amsterdam is located in the western Netherlands, in the province of North Holland. The river Amstel terminates in the city centre and connects to a large number of canals that eventually terminate in the IJ. 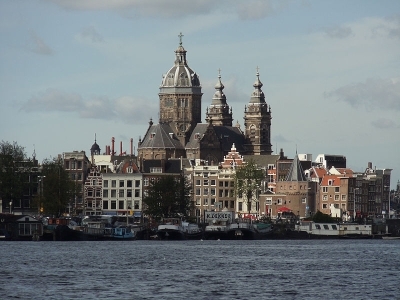 Amsterdam is situated 2 metres (6.6 feet) below sea level. The surrounding land is flat as it is formed of large polders. A man made forest, Amsterdamse Bos, is situated southwest. Amsterdam is connected to the North Sea through the long North Sea Canal. Amsterdam is intensely urbanised, as is the Amsterdam metropolitan area surrounding the city. Comprising 219.4 square kilometres (84.7 square miles) of land, the city proper has 4,457 inhabitants per km2 and 2,275 houses per km2. Parks and nature reserves make up 12% of Amsterdam's land area.